Villa Mari Pollensa is in a great position, located roughly midway between Pollensa Old Town, Puerto Pollensa and Alcudia. A huge choice of shops, restaurants, beaches and attractions are all within a very short drive. Staying at Villa Mari Pollensa you'll have your own large private swimming pool, plus views of the surrounding countryside and distant mountains. This traditional Majorcan house has 3 bedrooms and includes air conditioning/heating in the bedrooms and WiFi. The large private pool and great central position - Pollensa, Puerto Pollensa and Alcudia are all within a short drive! 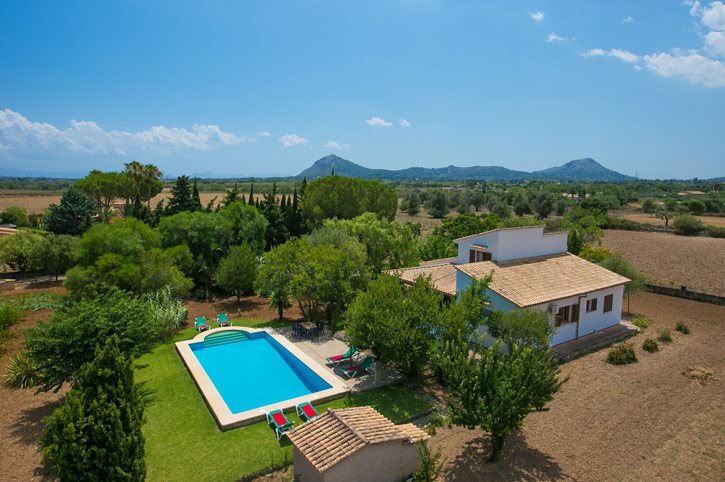 The large swimming pool and grounds of Villa Mari Pollensa have plenty of space to swim or sunbathe, and take in your picturesque countryside surroundings. If you decide to dine in, there is a brick BBQ and an eating area shaded by the pergola for dining in comfort, away from the sun. A long gravel driveway leads up to the private parking area, which is bordered by rose bushes and palm trees. Steps from here lead up to a walkway which circles the house, and brings you to the main entrance of the villa. The lounge and dining area are open plan. There is comfortable seating around the flat screen TV, a dining table and chairs and patio doors opening onto the pool terrace. The living area is decorated in a traditional Majorcan fashion, with a beamed ceiling and wooden decor. A hallway on the right of the lounge leads to the kitchen, which is fully equipped and also has a small breakfast table and a window overlooking the pool. On the ground floor is a double bedroom and twin bedroom, which share a separate bathroom. The twin bedroom has 2 windows which overlook the Puig de Maria hillside and surrounding country. The second twin bedroom is upstairs. This bedroom has an en suite shower room as well as fantastic panoramic views across to Formentor and La Victoria. Villa Mari Pollensa is perfectly positioned in the area of Cap Can de Bou, between the resorts of Pollensa (Pollenca), Puerto Pollensa (Puerto Pollenca) and Alcudia. The shops and restaurants of all 3 areas are within a short drive, offering a large and diverse choice, from authentic Spanish cuisine to more contemporary and laid back menus. A number of great beaches are also at your fingertips, the nearest being the huge sandy bay of Puerto Pollensa. The old towns of both Pollensa and Alcudia offer an array of traditional tapas and paella venues, whilst Alcudia Marina and Puerto Pollensa have a more contemporary vibe, with views over the water. The old towns and the main square, or plaza, or Puerto Pollensa are all host to a lively weekly market too. You'll also find a choice of beachwear and souvenir shops in the areas, as well as local shops for daily essentials. Within a short drive you'll find a number of excellent beaches, both small and large. Puerto Pollensa and Alcudia each have a huge bay with golden sand, great for families. If the comfort and seclusion of a smaller beach is more tempting, the 2 picturesque coves of Cala San Vicente are around 7 miles north, or, a little further still is the beautiful beach of Formentor. The scenery from the hillside as you make your way along the coast is breath-taking - don't forget your camera! The Hidropark in Alcudia makes a great family day out, with a choice of rides and activities for all ages. They even have mini golf and a restaurant! All 3 resorts offer a range of things to do and see. Scenery lovers will be in their element! Scale the 365 steps from Pollensa Old Town square to the Calvari church and admire the views. Or, if you're looking for something a little less challenging, the drive up to La Victoria Monastery in Alcudia has spectacular panoramic sea views. The old town of Alcudia is also not to be missed. You can walk along the top of the surrounding medieval wall or, for a small charge, explore the neighbouring bull ring. Keen golfers will find 2 good courses nearby. Around 15 minutes' drive away is the popular Golf Pollensa course, or you'll find the Golf Alcanada course around 20 minutes away, on the other side of Alcudia. Walking and cycling are great ways to see more of the local area and scenery. You'll also find a choice of water sports and boat hire options in Puerto Pollensa. Villa Mari Pollensa is not available to book for season as it is sold out. Take a look here at the Majorca villas that are currently on sale. We absolutely loved the villa. The location was fantastic and the facilities were brilliant. We loved every minute of being there! The villa was as described. A car is essential for the villa because of the remote location.